Associate Justice Maria Lourdes Punzalan Aranal-Sereno is now the new appointed Supreme Court Chief Justice of the Philippines. The very first ever appointed female chief justice in the history of the country. 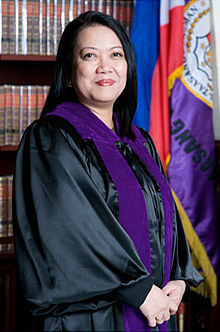 Maria Lourdes Sereno is the 24th Chief Justice of the Supreme Court which appointed by President Benigno Aquino III on August 24, 2012. According to Malacañang Palace's statement, "In the midst of this period of deep mourning for the loss of Interior and Local Government Secretary Jesse Robredo, the President is cognizant of his constitutional duty to appoint the next Chief Justice of the Philippines. He has therefore decided to appoint Associate Justice Maria Lourdes Punzalan Aranal-Sereno as the 24th Chief Justice of the Supreme Court." Statement added, "The President is confident that Chief Justice Sereno will lead the judiciary in undertaking much-needed reforms. We believe the Judicial Branch of government has a historic opportunity to restore our people's confidence in the judicial system." Former Associate Justice Maria Lourdes Sereno is set to stay in the Supreme court as Chief Justice for 18 years. She is the youngest appointed to the Chief Justice post at the age of 52. Comments or suggestions about "SC Chief Justice Maria Lourdes Sereno " is important to us, you may share it by using the comment box below.